Eleanor Bisbee, early analytic philosopher from Istanbul. A colleague in Boğazici, Istanbul, alerted me to the fact that an early American analytic philosopher once worked there. Eleanor Bisbee, born in 1893 in New Jersey began her career as a philosopher in the US, studying for a PhD at the University of Cincinatti in 1929, and then working there as assistant professor and later acting chair in the Philosophy department from 1930 to 1931. Around 1931, she took up a job as Professor of philosophy at Robert College and the American College for Girls, Istanbul (Robert College is now Boğazici). She worked there till 1942, and during that time published a number of articles in analytic philosophy. 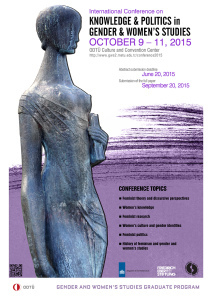 KNOWLEDGE AND POLITICS IN GENDER AND WOMEN’S STUDIES – METU, ANKARA 9-11 OCT.
I’m announcing this conference a bit late as the CfA is past, but I’m posting it as there a section on the history of feminism, gender and women’s studies so might be of interest to those readers who find themselves in Ankara this coming october. One of the major themes of mathematical logic in the twentieth century has been the satisfiability problem for first-order formulas, also known as the classical decision problem and as Hilbert’s Entscheidungsproblem. In full generality, the problem was shown to be undecidable by Alonso Church and Alan Turing in the 1930s. In order to circumvent this negative result, which is sometimes called “Church’s Curse”, various decidable fragments of first-order logic have been proposed (i.e., syntactic fragments of first-order logic for which the satisfiability problem is decidable). These fragments typically involve restrictions on quantifier alternation, on the number of variables used in formulas, or allowed patterns of quantification. In this talk, I will discuss a recently developed, different approach to taming first order logic, that restricts the allowed use of negation in formulas. It turns out that this leads to expressive decidable fragments that generalize a number of existing formalisms and use cases from different areas of application, such as data management and temporal logic. The talk will be preceded by a screening of a ten minute documentary made my the speaker about the Syrian refugee crisis. Whose Responsibility is the Syrian Refugee Crisis? From Justice between States, to Justice for Refugees. Very little effort has so far been expended by migration theorists to explain the character of a just distribution of refugees between states. Most studies instead have offered ample explanations regarding why refugees and migrants move to some states rather than others (Gibney, 2009). Since an adequate baseline from which to judge the justice of the distribution of refugees between states is still lacking, any new patterns of movement we might advocate creates possibilities for new unjust distribution patterns, a normative scrutiny that takes into consideration justice to refugees (besides justice between states) is of paramount importance. In this paper I analyse few of the main proposals of refugee distribution among states from a perspective of justice and argue in favour of the burden-sharing model that prioritizes justice to refugees. Specifically, I briefly analyse the “Syrian refugee crises” and I conceptualize it as an “engineered regionalism”, according to which the most conspicuous number of refugees end up seeking refuge in the region of their origin. In the second section, I explain why engineered regionalism is problematic from a justice perspective, and therefore explore alternatives we commonly think of in the literature as burden-sharing options. In the third section I argue that the respective alternatives are also morally unsatisfactory. They are all based on the presupposition that a right to free movement is what will entitle the refugee to (re)- settle to the country of one’s choosing, whereas this right is grounded on a philosophically informed principle of non-refoulement (as the ‘fire’ illustration proves). I attempt in the last section to propose a new model that is informed by the latter principle. This paper was written while I was a Marie Curie Fellow at the Migration Research Center Mirekoc and the Department of International Relations at Koc University, Istanbul, Turkey. I am grateful to the Director of the Center, Ahmed Icduygu, and the colleagues from the Center for their support. The research leading to these results has received funding from the European Union’s Seventh Framework Programme (FP7/2007-2013) under grant agreement n° 316796. Invitation esp. for junior scholars who have written a PhD thesis, paper, or book on Wittgenstein’s political philosophy, to submit a title and abstract (400-500 words) by 15 Aug. 2015 to politikfelsefe@politikfelsefe.org or wittgenstein@politikfelsefe.org .